If you need to dry clothes indoors and don’t have a tumble dryer then you are usually limited to placing wet items on a radiator or using a clothes airer. A product that has grown in popularity over the last few years is a heated indoor airer. These basically come in two varieties (hot air or heated rail) and allow clothes to be dried indoors. Drying time is not as quick as using a tumble drier but heated airers provide a cost-effective alternative to tumble driers. In this buying guide, we take a look at some of the best selling heated airers available right now, plus the original JML Dri Buddi. The biggest benefit of this airer is that it is electric, so it dries your clothes quicker, is gentler on your clothes, and can be used inside easier. You’ll also really love the design of this clothes dryer because it is super easy to hang all your laundry up and it doesn’t take up an absurd amount of room. If you don’t like the way the shelves are arranged though, you can change them easily. It has 21 meters of drying space and is very lightweight, which makes storing it super easy. You can also dry absolutely everything on this airer, from trousers and shirts to socks and even delicates. There are several versions of the Dry:Soon available included a “Deluxe” version that features a timer. The downside of this airer is that since it is electric, it does cost money to run. However, it is significantly less than a standard tumble dryer and is actually very cheap. The benefits are definitely worth a few pounds worth of electricity; you won’t even notice it on your bill, making this one one of the best clothes airers. 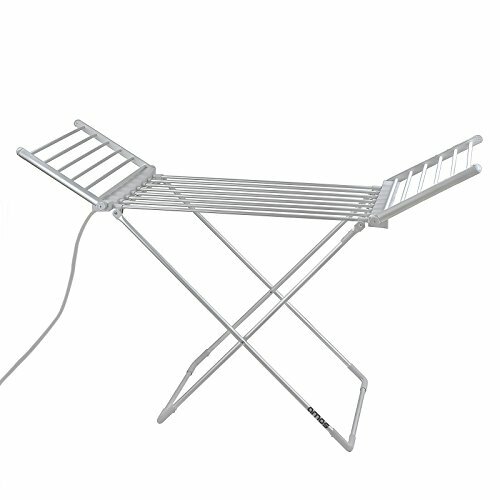 The Amos heated airer is significantly cheaper than the Lakeland models but has a similar design and washing load capacity (15kg). The Amos is similar to the original Dri Buddi in that it dries the clothes by blowing hot air into the covered clothes rails. Clothes are position over 2 tiers and the Amos has a footprint of 70cm by 48cm so doesn’t take up a lot of room. The Amos does include a number of neat touches though. Its mounted on 4 castor wheels so is easy to move around room plus it can also be folded into a flat position for easy storage (it should fit under a lot of beds). On the Lakeland Dry:Soon models you have to pay extra for the cover but on the Amos Eezy Dry this is included. The cover also is built into the frame so you don’t have to remove it when storing the dryer away. This heated airer also has a timer function that ranges between 20 mins and 4 hours and a remote control (this is quite handed as the control are mounted quite close to the floor). 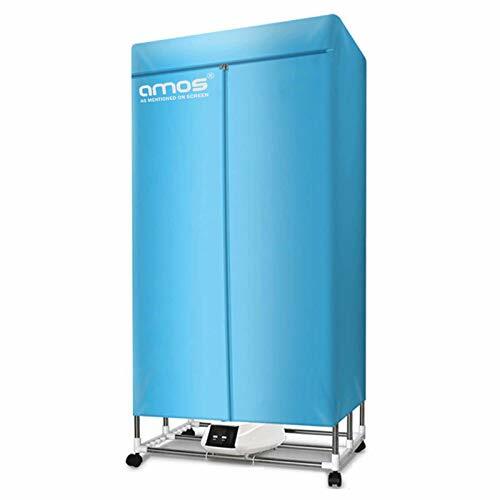 This is the second featured product from Amos, however, the 230 is a different design and drying method to the Amos Eezy Dry as it uses heated rails instead of using hot air. 18 drying rails are available so you’ll have plenty of room for your laundry. As this uses heated rails you will need to ensure that your clothes are fully spun before placing on the rack to help with the drying speed. The Amos 230 is a folding rack type airer and therefore takes or more floor space than the upright heated airers but also at the same time has less drying capacity at 10kg (compared to15kg on most upright models). This airer is much cheaper than some of the hot air driers though. Features are pretty limited – there is no timer on this model, for instance. The Amos 230 does folds away easily and is more compact and easier to store than the bulkier upright models. 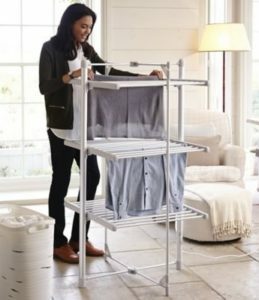 The Dri Buddi is a unique clothes airer unlike any other on this list. 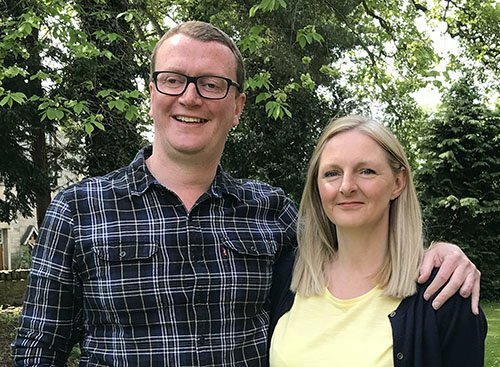 It is much gentler on clothes than a standard tumble dryer and it even gets rid of creases. The airer also operates very quietly; you won’t even notice it’s on. It is super easy to assemble and can be done in less than 10 minutes, and is even easier to operate. All you do is turn the dial and let the Dri Buddi do the rest. It can hold up the 10 kilos of clothing and takes up hardly any room. The only downside of the Dri Buddi is that you have to pay to run this one as well. But it doesn’t use a lot of energy and is still definitely worth the purchase.